A simple scribe vanishes from his shop during a suspicious fire, leaving the heroes—the only people he can trust—hints as to his whereabouts. The heroes must collect clues, unmask spies, and infiltrate an exclusive party to find the missing scribe. These clues reveal a murderous plot stretching from the untamed forest to the highest social elite, and the heroes are the only ones who can expose the villains. This module clocks in at 66 pages, 1 page front cover, 1 page editorial, 1 page ToC, 1 page SRD, leaving us with a massive 62 pages of content, so let's take a look! As always with modules, the following text does contain SPOILERS. Potential players should jump to the conclusion to avoid spoiling this adventure. All right, only GMs around? Great! We enter the stage this time around in the town of Thaven (fully mapped), where a former adventurer-turned notary/scrivener, the gnome Gustavus Hodgedar, hires the PCs, who has inadvertently stumbled over a dastardly plot - but he doesn't know that yet. What he does know is that a shipment has disappeared - oddly, one containing histories of the local town and its eminent families...strange target, right? Anyways, the man who was supposed to bring them hasn't shown and thus, the PCs happen upon a complex plot that transcends the humble beginnings. Upon finding the missing cart, the PCs will have to deal with lethal traps and gremlins, but, upon returning, they will not find an open office, but rather the charred remains of Gustavus' house, with a fire brought under control only to a nearby shop of weird contraptions. Investigating the onlookers, watchmen and checking out Gustavus' shop, the PCs will realize pretty soon that Gustavus hasn't perished in the fire - instead, he's nowhere to be seen. This would be as good a place as any to comment on the extensive diversification of skill-result benefits: Scaling degrees of success yield different information, with most checks providing not only 2-3, but even more diverse results. I really like this from a design perspective. Similarly, I enjoy the sense of concise magical realism evoked by the utilization of proper spells: You see, as the PCs are investigating, they stumble upon an animal messenger with a handout note, telling them about Gustavus being held hostage in a wine cellar. Unbeknown to the PCs, their investigations are already shadowed by an agent of the antagonists, who then continues to exert subtle pressure as the PCs try to piece together the clues in a massive, detailed investigation scenario. The wine-label upon which they received their message makes for an obvious clue that yields the information, that it's from a rare vintage indeed - only two bottles having been sold in recent history. beyond training with clockwork dummies in the local fighter's brotherhood, the PCs may also learn about Gustavus less legal endeavors, while a lavishly detailed tavern becomes the staging point for an assault by the PC's adversaries. Beyond clockworkery and *A LOT* of means to unearth details (sporting counter-intelligence-info for the foes of the PCs) and several rather detailed encounters, the PCs will note that the esteemed Reniverrea family might be involved. In order to free Gustavus, they will have to infiltrate the massive, gorgeously mapped Renvierrea estate, which, coincidentally, hosts a massive birthday party - and here, things get full-blown magic spy-genre. Handling the party and investigating the Gustavus-connection may yield some rather surprising pieces of information, a corpse and some rather disquieting implications - however things go, the trail does lead towards the untamed wild, for it seems like Balanidhren's daughter has fallen in love with a satyr - and perhaps, they may recover the books and piece things together and confront the conspirators: You see, an evil fey has secretly seeded changeling-like creatures, the Paoternosh, born from the vile womb of the evil belgar. Said creatures has executed a hostile take-over of the Renvierrea family that included a doppelganger, aforementioned satyr, its spawn and copious amounts of gaslighting....a plot that was jeopardized by Gustavus' books. 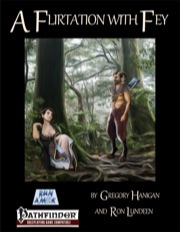 How things ultimately turn out and how much your PCs find out about the plot, though, depends on their prowess...and yes, this module's aftermath can yield certainly many more adventures as follow-ups, particularly since the city of Thaven is actually provided in the appendices in lavish detail - including a feat for Mephit familiars and 3 solid traits for local PCs. Thaven most certainly is an interesting village that can act as a great starting place for subsequent adventures. 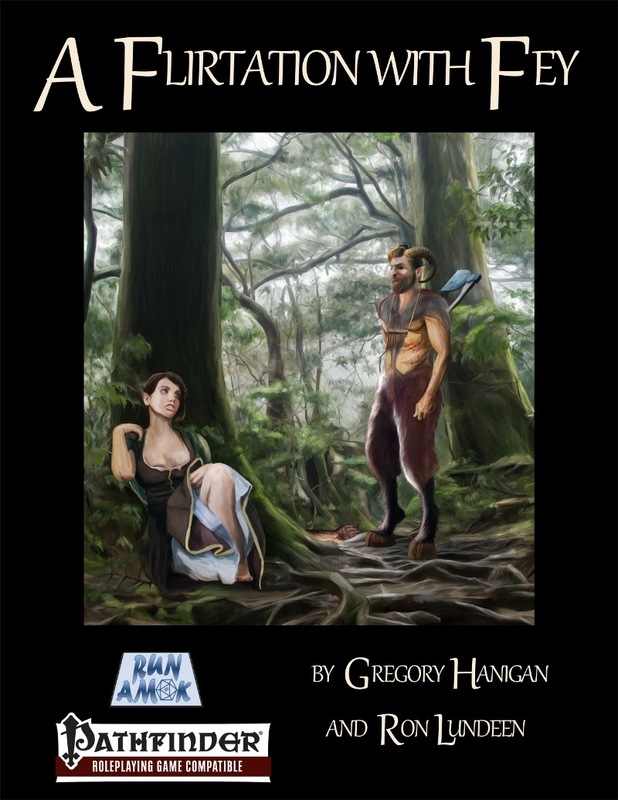 Beyond this, the module contains very detailed scaling rules for PCs of 2nd and 5th/6th level, including an upgraded CR 8 version of the satyr. The module's new monsters, much like many of the NPCs herein, get full stats and accompanying high-quality b/w-artworks and no less than 4 handouts and 5 pregens supplement the module and make it pretty easy on the GM to run. You know what's even better? The adventure comes with a massive 25-page map-booklet, which sports the maps in regular size AND in an enlarged battle-map size that you can print out and cut up. Quality-wise, the maps (with two exceptions) are Paizo-level of beauty - so yeah, this may be worth the low asking price for the maps alone. Oh, and in the map-bonus, the maps are in gorgeous full-color! Editing and formatting are top-notch, I noticed no significant glitches. Layout adheres to Run Amok Games' printer-friendly two-column b/w-standard and sports numerous beautiful B/w-artworks, none of which I've seen before. So yes, this is an aesthetically truly pleasing book. The map-booklet with its superb cartography and the blown-up maps for battle-map use, all player-friendly, is just the icing on the awesome cake regarding the use of cartography as handouts and GM-friendliness - publishers and authors, take a look here: This is how it's done. Gregory Hanigan and Ron Lundeen deliver, let me state that very clearly, one absolutely awesome investigation module - barring means to get unduly stuck, the constant presence of thwarting agents and modular nature of this module, alongside its overarching plot and compellingly written gazetteer make this not only a great, fun module, but also a compelling starting point for more adventures in and around the surprisingly concise and alive city of Thaven. With relatively subdued clockwork-elements, this is easily transported to Midgard and, should you dislike steampunkish elements, you can easily explain them away as magical or simply ignore/reskin the few of these elements that can be found in this book. With different degrees of success and easy tools for the GM to control the pace (the rats), we have an investigation that is surprisingly fast-paced, but still manages to build up tension and even end with a nasty "darker things to come"-realization if your players have truly grasped the threat behind the adventure's plot. Well written, concise and very considerate for the diverse needs of different groups, this is a stellar adventure well worth a final verdict of 5 stars + seal of approval.